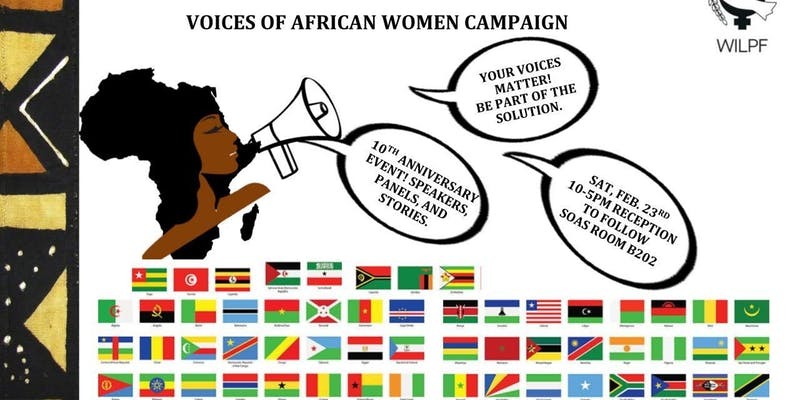 UK WILPF invite you to celebrate the 10th anniversary of our incredible Voices of African Women campaign. Voices of African Women was set up by diaspora women living in the United Kingdom in 2009, and was initially founded to listen to the issues facing diaspora, refugee and immigrant African women. It has since become one of UK WILPF’s leading campaigns, and has included impactful projects such as human rights training and Voices of Refugee women. Members working within the project are very active in other communities too, such as Sudanese Mothers for Peace, Voice of Somali Women’s Movement, Network of Eritrean Women, and Voice of Dafur Women and Common Cause UK (a platform of D.R. Congolese Women). In bringing these groups together, the campaign amplifies the voices of women in the African UK diaspora. Please join us on Saturday 23rd of February, where we will give platform to and learn from an incredible range of speakers and campaigners representing over seven African nations. Consisting of various panel discussions and keynote speeches, sessions will include topics such as African women’s participation in politics and African diaspora and the Law. We will also engage with the voices of younger and queer women. We are excited to announce that among our keynote speakers are Aleida Borges and Lucia Kula. The event will take place on Saturday 23 February at SOAS, University of London. It will be held in room B202 and will run from 10am to 5pm. Tickets are free, and refreshments will be served. In order to attend, please register on eventbrite here. Join us in both celebrating and learning from these incredible women.